Building castles takes a lot of energy. Middle age castles could take decades and hundreds of people to build. They were made to last for a very long time and to resist every kind of attack. Nevertheless, they were conquered and destroyed. They were fortresses and houses at the same time, built to protect their owners and make to them feel comfortable and secure, a way for important families to say, “We’re powerful and we’re here to stay”… but of course they are no longer there. The castles we build in our Christian lives have very similar features. We try to build structures that can last in time, strong enough not to fear any kind of attack from our enemies, and comfortable enough to give us the feeling that we are now ok, nothing will happen to us anymore. The structures can be our successful job, our family’s prosperity, or important relationships we have, but it can also be our church or our ministry that makes us think we deserve God’s favor, that we are in a good position in the Christian society. All these and many other things can become our earthly castles in which we invest all our energies, all our time and resources, sometimes for our whole lives. Of course we know, as Christians, that we shouldn’t be too attached to earthly treasures, but the problem with this kind of treasure is that they seem to give us what we really need, stability, security, peace and appreciation from others, and finally a “name” that will last for a very long time. You can easily tell the difference between castles when they are under siege. When earthly castles are conquered they become one of those ruins where people who pass by “fear and whistle” (Ez.27:36) remembering how famous and strong they were. 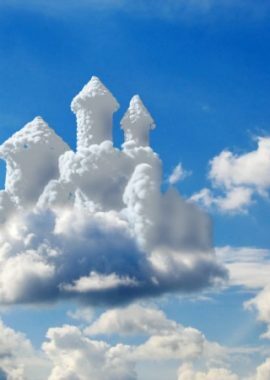 Heavenly castles can go through hard times, they can even be destroyed, but they will always reappear in a new form or in a new place, because you can’t stop the Spirit of God. Castles aren’t wrong in themselves, they become wrong when we built them in the wrong place and give them the wrong importance. That’s why it’s sometimes difficult to distinguish between a blessed and sound Christian ministry and a flesh-driven organization or church. From the outside, they tend to look similar, but they are different because they are built in different kingdoms and with different materials. Castles built in the kingdom of heaven, up there in the sky, seem more fragile and utopic. They are often underfunded, have lighter structures, and are more people-oriented. Yet, they are more lively and actually stronger, because they’re grounded in the Spirit, not on a real estate investment. On the other hand, earthly castles can look bigger and stronger, even more beautiful to see, but they lack the source of living water that allows them to spiritually thrive. Let’s be clear. Being efficient and organized, and even being physically visible within our society is extremely important for every kind of organization. However, no efficiency, no hierarchy and no brick building can ever substitute God’s guidance. The Spirit is like the wind, you feel it but you don’t see where it comes from nor where it goes (Jn 3:8). Air seems the most unstable, temporary and fragile of elements, but it can shape the world, its mountains, its weather, and the lives of all its inhabitants. Only the spirit of God can give every person on this earth what they really need, adoption and eternal life; not a fake security, not the feel-good placebo that so many “Christian” ministries sell abundantly these days. Instead, we are gifted with the right to become children of God. As Jesus said, let’s not judge from appearances (Jn 7:24), and when we feel called to serve the Lord, let’s make sure we are building our castles with the right elements and in the right location. We will all pass, this world will pass through fire, but only what is built with spiritual materials will last. For no one can lay any foundation other than the one already laid, which is Jesus Christ. If anyone builds on this foundation using gold, silver, costly stones, wood, hay or straw, their work will be shown for what it is, because the Day will bring it to light. It will be revealed with fire, and the fire will test the quality of each person’s work. If what has been built survives, the builder will receive a reward. If it is burned up, the builder will suffer loss but yet will be saved—even though only as one escaping through the flames.